The real Tom Brady was not in Arizona to play the Cardinals on Sunday because he was serving the first game of his four-game deflategate suspension. However, the Patriots still came away with a 23-21 victory. How did that happen? Well, some will credit backup QB Jimmy Garoppolo for ably filling in for the Deflator, going 24 for 33 with 264 yards and a touchdown. Others will blame the bad snap that led to a missed 47-yard field goal on Arizona’s final play the game. Me? I credit the presence of FakeBrady. Who is FakeBrady, you ask? He’s a Patriots fan with a Tom Brady mask. But it’s not just any Tom Brady mask. It’s a hyperrealistic, insanely creepy Tom Brady mask. 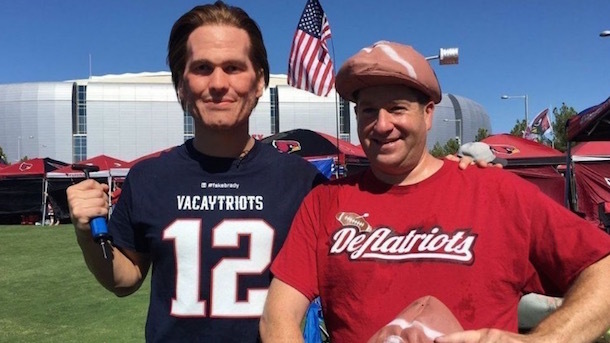 FakeBrady was tailgating with Patriots fans before the game on Sunday, and he was obviously the Patriots’ good luck charm.